For the farro and lentils, in a medium sized pot begin by adding in the oil and once hot add the onions and sauté until translucent. Add the water and vegetable stock right after. Rinse the lentils and farro using a colander. Place in the pot and once it boils set to a simmer for 35-40 minutes. Once done, discard excess water and set aside with lid off to cool. While the farro and lentils are cooking clean your carrots (no need to peel them), marinate with garlic powder, oil, salt, and black pepper. Line a small pan with foil or parchment paper, then roast in an oven at 350 degrees for about 35-40 minutes (or until softened). For the cashew sauce, strain your cashews, throw all ingredients into a vitamix or highspeed blender and blend until perfectly smooth. 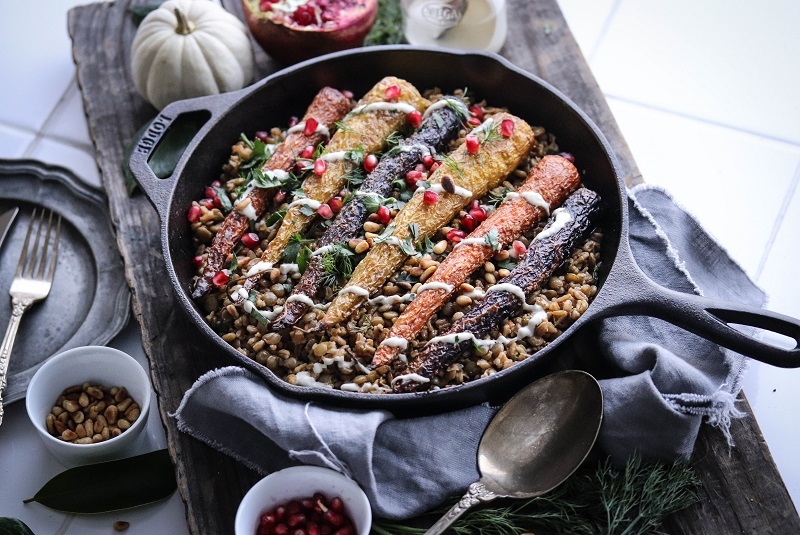 Place lentils in a dish, line the carrots, and then top with cashew sauce, pomegranate seeds, fresh dill and parsley. Enjoy!